Plastic jigsaw puzzle designed for person with dementia, that is wipeable in envrionments where infection control is important. 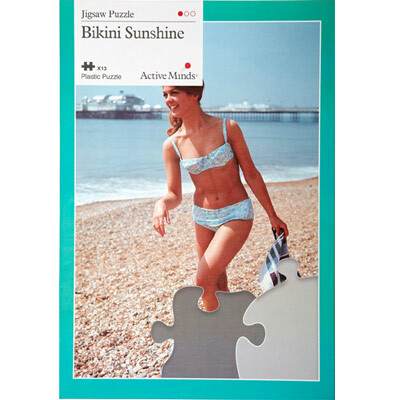 This 13 piece plastic jigsaw puzzle – Bikini Sunshine, is suitable for the person in the mid to late point of their dementia journey, with an image that is a tool to spark memories and encourage conversation. The image is age appropriate, enabling engagement of the person with dementia without being childish or patronising. The large, durable plastic pieces have a matt coating (no glare) and are easy to hold for those with limited dexterity. The outlines on the shaded backboard act as a guide to assist the person to place the pieces in the correct spot. Picture on the box lid also assists the person to complete the puzzle. The puzzles are made from plastic making them, durable, easy to clean and infection control compliant for care settings such as in hospitals or residential aged care homes.